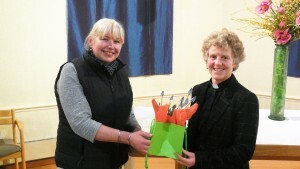 WOKING’S churches have bid farewell to Rev Cathy Blair as their Rural Dean. Representatives from across the borough said their goodbyes to Cathy, who was licensed as Rural Dean for the borough in June 2010, at the recent Deanery Synod meeting. St Paul’s Church in Oriental Road are now also looking for a new vicar as Cathy and her joint-vicar (husband Jonny) take up new roles at a parish in Walton-on-Thames. Woking Deanery covers local CofE churches from Pirbright to Byfleet and is part of the Guildford Diocese. During her tenure, Cathy says her three main goals have been to increase collaboration between churches, encourage mutual support between leaders, and to assist volunteers through training and networking opportunities. Working alongside Chris Holloway and Rev Steve Beak from St Mary of Bethany Church, Cathy has set up leadership courses for volunteers, which has had take-up from eight churches over the same number of years. After originally training as an architect, Cathy and Jonny moved to Woking from Nottingham – via South Africa – to begin their joint ministry at St Andrew’s in Goldsworth Park before moving across town to Maybury. During nine-and-a-half years in Maybury, Cathy has been Governor of both Christ’s College Guildford and the New Monument & Broadmere Multi Academy Trust, as well as being a founding trustee of the Maybury and Sheerwater Community Trust, a charity providing practical help for people in the two wards. She will continue to serve on the Bishop’s Advisory Council and recently became Chair of the Diocesan Clergy. “God has been so good to us at every stage of our lives serving him,” said Cathy, who admits her three children – who have grown up in Woking – are glad that Walton-on-Thames is not too far away.